Talk. Read. Sing. ® Fest! is heading to the museums! Join First 5 San Bernardino for FREE* fun for infants, toddlers and preschoolers (ages 5 and under) as we champion the three little action words that make a BIG impact on your child’s learning. *Free Admission is limited! Arrive Early! 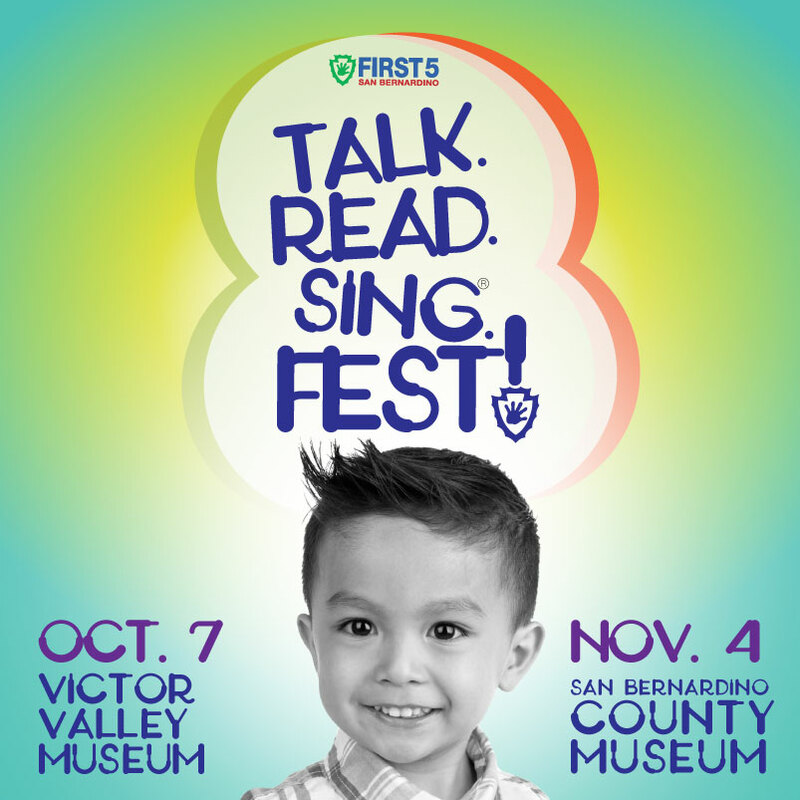 In partnership with San Bernardino County Museums, we’ll have entertainment and performances, kid-friendly activities, and our book giveaway for children ages 5 and under! Enjoy performances by Twinkle Time & Friends, Chazz the Drummer, and a variety of exhibits throughout the museums. Make it a play date! Join us in Apple Valley at the Victor Valley Museum on Saturday, Oct. 7, 2017 from 10 a.m. to 3 p.m. or in Redlands at the San Bernardino County Museum on Saturday, Nov. 4, 2017 from 9 a.m.-2 p.m. for all the early learning fun! For more information, call First 5 San Bernardino at (909) 386-7706 or visit First 5 San Bernardino on Facebook. First 5 San Bernardino and American Academy of Pediatrics, California Chapter 2 have partnered to bring an early literacy initiative to pediatric care waiting rooms. Reach Out & Read® is a national program that distributes books through pediatricians to connect reading as a vital practice for quality early childhood development. While in the waiting room, volunteer readers or parents themselves are provided books to read to their children, increasing the child’s interaction and exposure to words. Parents of children ages 5 and under will able to take prescribed books home to build their child’s library and early literacy capacity. 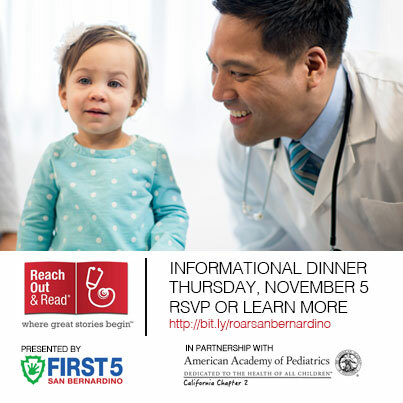 First 5 San Bernardino in partnership with American Academy of Pediatrics, California Chapter 2 is hosting an informational dinner for pediatricians, pediatric subspecialists and pediatric medical representatives to introduce the program and gain interest from the local medical community. The first event, ROAR & Explore the Possibilities!, is set for Thursday, Nov. 5, at the office of First 5 San Bernardino located at 735 E. Carnegie Drive, Suite 150 in San Bernardino from 6:30 p.m. to 9 p.m. Details on an additional dinner targeting the High Desert region are forthcoming. For more information on this initiative in San Bernardino County or to register and RSVP for the informational dinner, visit http://bit.ly/roarsanbernardino or call (909) 386-7706. For information on the national program, visit www.reachoutandread.org. Talk. Read. Sing. ® Fest! is coming to Hesperia Branch Library on Saturday, Oct. 3 and Highland Branch Library on Saturday, Nov. 7! Enjoy FREE fun for infants, toddlers and preschoolers ages 5 and under as we champion the three little action words that make a BIG impact on your child’s learning. 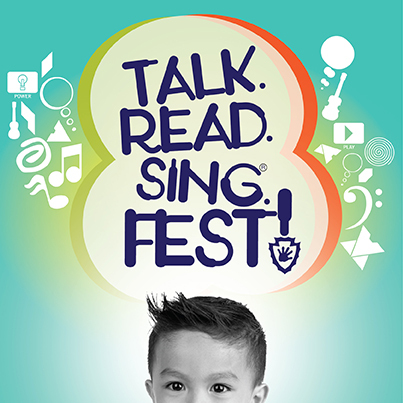 In partnership with San Bernardino County Library, we’ll have special performances by Twinkle Time & Friends, Rafael & Katia’s Magic Show and guitarist Dan Crow. Take photos with Potter the Otter and other story characters. Participate in kid-friendly activities and don’t forget our book giveaway for children ages 5 and under! Parents, don’t miss the special talks on the importance of Talk. Read. Sing. ® with your children before the performances take place. Make it a play date! Join us on Saturday, Oct. 3, 2015 from 10 a.m. to 3 p.m. at Hesperia Branch Library, 9650 7th Ave in Hesperia or Saturday, Nov. 7 from 9 a.m. to 2 p.m. at Highland Branch Library, 7863 Central Ave in Highland for all the early learning fun! For more information, call First 5 San Bernardino at (909) 386-7706 or visit First 5 San Bernardino on Facebook. Talk. Read. Sing. ® is a registered trademark of First 5 California. AmeriCorps, a National Service Program dedicated to serving the needs of local communities, partners with First 5 San Bernardino to make a commitment to serve San Bernardino County’s youngest population. For an AmeriCorps volunteer’s time as a Preschool Coach with First 5 San Bernardino, the volunteer will receive an allowance to offset their living expenses while they are serving their community. Upon completion of their commitment, an AmeriCorps volunteer is also qualified for an Education Award that can be used to pay for college expenses. Individuals who possess a minimum of 12 units in human services, health services or early education fields and are interested in expanding their professional opportunities to include working with preschool-aged children, are encouraged to apply. Applicants will be subject to eligibility verification, fingerprinting and background clearance. If you are interested in making a difference in your community as an AmeriCorps volunteer, ensuring that children are ready to enter and succeed in school, call Mary Alvarez (909) 386-7706 or visit our website at www.first5sanbernardino.org for more information. Deadline to apply is Friday, June 15, 2015 by 4 p.m. Click here for more information. 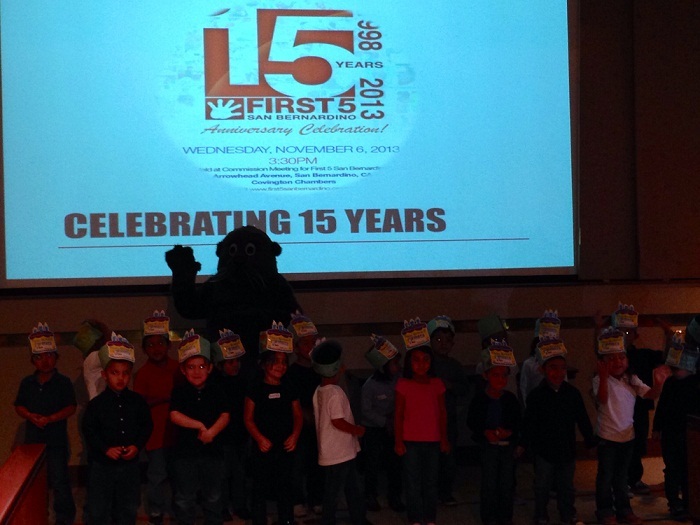 Rialto preschool children gathered with Potter the Otter in the Board of Supervisors Covington Chambers on Wednesday to sing Happy Birthday and celebrate the 15th anniversary of First 5 San Bernardino. November 3 marked the 15th anniversary of voter-approved Proposition 10 which funds First 5 San Bernardino, an early childhood development initiative, through cigarette and tobacco-product taxes. Pioneers behind Proposition 10’s legislation, founding commissioners and champions of the agency including Kent Paxton of the Children’s Network, Arrowhead Regional Medical Center’s Director of Women’s Health, Dr. Guillermo Valenzuela and Fifth District County Supervisor Josie Gonzales, and former County Administrative Officer John Michaelson presented comments on the early phases of First 5 San Bernardino. “The millions of dollars that have been invested have influenced the nonprofit sector, our community infrastructure, and the delivery of developmental services for children. This has resulted in children experiencing positive outcomes for health and safety needs, and also enhances the quality of learning. Children have been positioned to fare better in education and in life, through our investments,” said Karen Scott, executive director of First 5.